When first-year graduate student Sudhir Venkatesh walked into an abandoned building in one of Chicago’s most notorious housing projects, he hoped to find a few people willing to take a multiple-choice survey on urban poverty--and impress his professors with his boldness. He never imagined that as a result of this assignment he would befriend a gang leader named JT and spend the better part of a decade embedded inside the projects under JT’s protection. From a privileged position of unprecedented access, Venkatesh observed JT and the rest of his gang as they operated their crack-selling business, made peace with their neighbors, evaded the law, and rose up or fell within the ranks of the gang’s complex hierarchical structure. 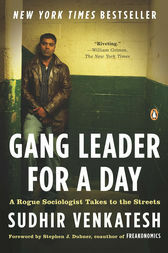 Examining the morally ambiguous, highly intricate, and often corrupt struggle to survive in an urban war zone, Gang Leader for a Day also tells the story of the complicated friendship that develops between Venkatesh and JT--two young and ambitious men a universe apart. Sudhir Venkatesh is professor of sociology and African American studies at Columbia University. His writings, stories, and documentaries have appeared in The American Prospect, and on PBS and National Public Radio’s This American Life.